There are many factors that affect a damping units performance. Fluid dynamics, friction, heat, piston design etc. For the most part, we are not trying to alter these factors when revalving suspensions. By using the stock piston and high quality suspension fluid, most of these factors will remain constant and acceptable. What we do alter is the number and placement of shims in the stack. That is what suspension revalving is. . . adjusting the stiffness of the shim stack to alter the oil flow through the piston. This in turn has a direct affect on the damping forces of the suspension unit. The discs springs that are typically found in suspension units are refered to as "initially flat conical disk spring with a cross section of constant thickness". Or, as we call them in the real world, shims. We refer to the stiffness of a shim as the shim's load, or we may also refer to it as the shim's spring rate. These force numbers are represented in pounds (lbs). We refer to the amount a shim bends as the it's deflection. These numbers are represented in inches. When we are discussing shims not installed in a damper, the load refers to the calculated or measured force applied to the shim stack to produce a given deflection. Shims are nothing more than flat springs. Unlike coil springs however, shims produce a nonlinear load-deflection curve. Table 2 shows the load-deflection values for a 250 lb coil spring. Ideally, coil springs would produce a linear rate-displacement curve. 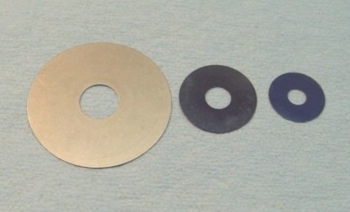 Table 3 shows the load-deflection values for a 40mm x .20mm shim with a 20mm base. 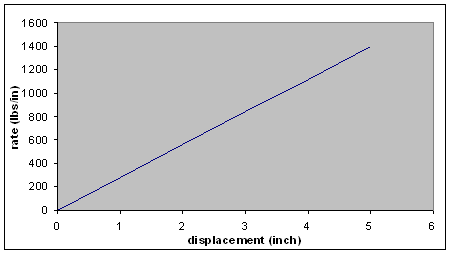 As shown in Table 3, shims have a nonlinear load-deflection curve. This means the shims get proportionally stiffer as deflections increase. 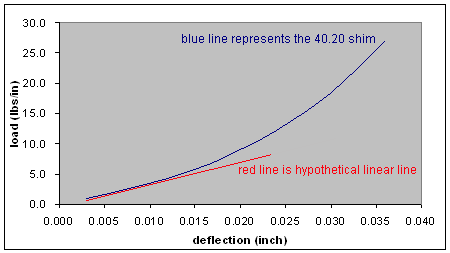 Chart 2 shows the load-deflection curve for a 40mm x .20mm shim. The load starts off fairly linear up to about .010 inch deflection, then takes a sharp increase, with the load becoming stiffer as the deflections increase. This nonlinear rise in rate is characteristic of flat disc springs only when the shims bend without distortion. Piston designs have a direct affect on the shim distortion. Some piston designs allow the shims to deflect without distortion, the most common designs bend the shims at four points, and some designs actually bend the shims like a taco shell. Therefore, the load-deflection curve of any particular shim stack is dependent on the piston.